Finely chop the garlic and ginger and put in a deep roasting tray or big pot suitable for the oven along with the ribs and all the other ingredients. Mix everything together thoroughly, ensuring the ribs are well covered. Transfer the ribs to the oven and cook uncovered for at least 2–3 hours, basting and turning the ribs every so often so they don’t burn (if they do start to ‘catch’, turn your oven down slightly). Towards the end of the cooking time the ribs will start to break up and fall apart slightly – this is a good sign, but you want to keep them as whole as possible (ready for grilling), so be careful when turning. Transfer the ribs to a hot barbecue and cook in batches for 2–3 minutes on each side until the outsides of the ribs are glazed and charred. Drizzle over a little of the remaining sauce and sprinkle over some finely chopped spring onion to garnish. Enjoy. If you fancy cooking these on a normal night in (or the weather isn’t looking good) then pop the ribs under the hot grill in the oven instead of on the barbecue after roasting. 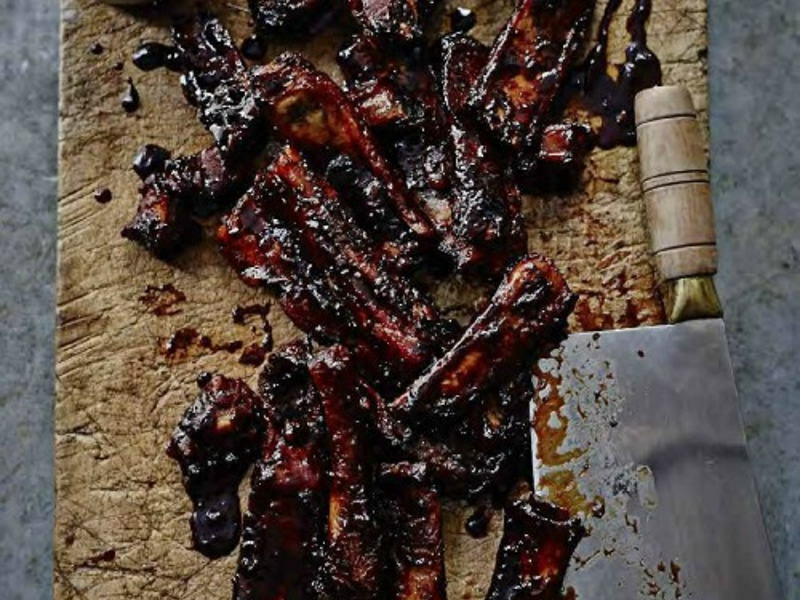 Although the ribs are always better after they’ve been grilled slightly, if you just can’t wait they can always be eaten straight after roasting in the oven.